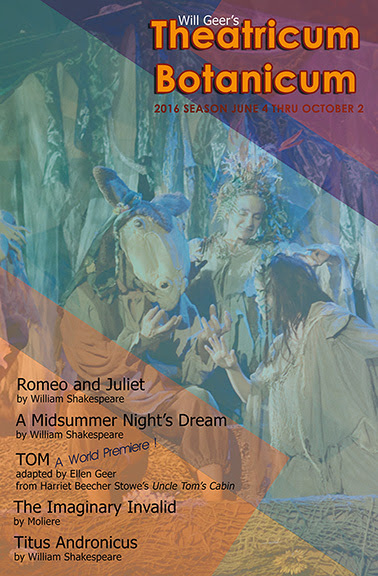 The year 2016 marks the remembrance, worldwide, of Shakespeare’s death 400 years ago, as well as what is shaping up to be a historic election year in the U.S. Will Geer’s Theatricum Botanicum summer season lineup of theater, music and performance includes four timeless classics that continue to reflect our life and times centuries later, shining a light on current social issues. It all takes place at Theatricum’s unique and spectacular outdoor setting under the California live oaks and summer skies of Topanga. The repertory season kicks off on June 4 with Romeo and Juliet, set in East Jerusalem. Director Ellen Geer elucidates the continued relevance of this 421-year-old play, setting Shakespeare’s tale of forbidden love and warring families in a city beset by age-old prejudices, street violence and religious differences. June 18 sees the opening of TOM, a world premiere adaptation with music, written and directed by Ellen Geer, that brings a fresh perspective to Harriet Beecher Stowe’s classic novel, “Uncle Tom’s Cabin.” Long before Black Lives Matter became part of our lexicon, Stowe’s great novel demanded freedom and equality for all, changing forever how Americans viewed slavery, galvanizing the abolition movement and contributing to the outbreak of the Civil War. Opening July 9, Mary Jo DuPrey (last season’s August: Osage County) directsConstance Congdon’s fresh and hilarious adaptation of The Imaginary Invalid,Molière’s skewering of the health care profession from an entirely different century. Plagued by a growing pile of medical bills, Madame Argan (Ellen Geer), a chronic hypochondriac, will go to any length to marry her daughter off to a doctor. Of course, her daughter has other ideas. This potent elixir of romantic triangles, double entendres and mistaken identities proves, in the end, that laughter really is the best medicine. Also starring Alan Blumenfeld as Dr. Purgeon. Beginning July 30, Titus Andronicus, directed by Ellen Geer, joins the season repertoire. How should a nation choose its leaders? What happens when a government insulates itself from the citizens it once served? What is the difference between justice and revenge? Theatricum sets Shakespeare's first tragedy, the violent tale of a government gone awry, in the future, to spark a flame of caution… but always with a flicker of hope. The return of Theatricum’s signature production of A Midsummer Night’s Dream, a beloved company staple that heralds the arrival of summer in Topanga. Once again, the most magical outdoor setting in Los Angeles is transformed into an enchanted forest, inhabited by lovers both fairy and human. DirectorMelora Marshall conjures up Shakespeare’s world of wonder, magic and romance. Comical misunderstandings and the pain of unrequited love are resolved, and all is reconciled through midsummer night revelries and the enduring power of nature. The five mainstage productions will play in repertory through Oct. 2. Unlike most theaters in the L.A. area that stage continuous runs of a single play, Theatricum, using a company of actors, will perform each of the plays in repertory, making it possible to see all five mainstage plays in a single summer weekend. In addition to theater, Theatricum will present five special performances on its mainstage, including Momentum Place, Theatricum’s annual offering of modern dance, aerial acts, juggling and performance art curated by Lexi Pearl, on Sunday, May 8 (Mother’s Day); Theatricum’s second annual Family Barn Dance and Bar-B-Que on Monday, July 4; The Woody Guthrie Story, a tribute to the songwriter, folklorist and labor leader who was also a longtime Theatricum friend, on Sunday, Sept. 18; a concert by Inara George and Friends on Sunday, Oct. 9; and Alsop for Adults, an evening of delightfully funny political songs by singer/songwriter Peter Alsop, on Saturday, Oct. 15. On Saturday, June 25, actor Beau Bridges will be joined by his son, Zeke, for a special reception and presentation at the Mountain Mermaid in Topanga, where the pair will read from Dalton Trumbo’s Johnny Got His Gun. All proceeds from this special fundraising event will benefit Theatricum’s artistic and educational programming. The beginnings of the Theatricum Botanicum can be traced to the early 1950s when Will Geer, a victim of the McCarthy era Hollywood blacklist (before he became known as the beloved Grandpa on The Waltons), opened a theater for blacklisted actors and folk singers on his property in Topanga. Friends such as Ford Rainey, John Randolph and Woody Guthrie joined him on the dirt stage for vigorous performances and inspired grassroots activism, while the audiences sat on railroad ties. Today, two outdoor amphitheaters are situated in the natural canyon ravine, where audiences are able to relax and enjoy the wilderness during an afternoon or evening's performance. Will Geer’s Theatricum Botanicum is located at 1419 North Topanga Canyon Blvd. in Topanga, midway between Pacific Coast Highway and the Ventura (101) Freeway. The amphitheaters are terraced into the hillside, so audience members are advised to dress casually (warmly for evenings) and bring cushions for bench seating. Picnickers are welcome on the grounds before or after the performances. For tickets, subscriptions, group discounts and a full schedule of theater, music and family entertainment, call 310-455-3723 or go to www.theatricum.com. Subscribe before Shakespeare’s birthday (April 23) for additional savings.